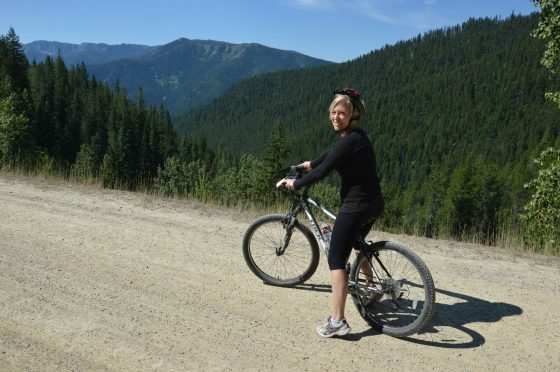 In this piece, I write about getting over my fear of biking by taking a bike ride down an old railroad trail on the Idaho/Montana border. The front entrance to the welcome center is not entirely legible, because years of snow and harsh Idaho winters have rubbed the black paint into a faint gray. The tip-off that we’ve made it here is the parking lot, which is full of cars and trucks and tourists, many—but not all—of whom already have their bikes and helmets but who simply need to get a day permit. We can also slightly make out the name on the front of the building: Lookout Pass Ski Resort, which means it’s official: we have made it across the panhandle, have made it to Exit 0, the exit that straddles, much like the ride we’re about to do, the Idaho-Montana state line. Even though it’s hardly a minute past 8 a.m., the welcome center is already busy, full of families and kids trying on helmets with headlamps and adjusting their rental bikes to fit their diverse body types. There’s an electric buzz to the room, a kind of hurriedness, as if no one actually wants to go through this extra step—everyone just wants to kick up their kickstands and hit the trail. After all, it’s a sunny July day, and what better way to spend the day than hauling the whole extended family along on a fifteen-mile-long mountain bike trail that winds through the Bitterroot Mountains of northern Idaho and western Montana along an old 19th-century railroad? Who wouldn’t want to hit the trailhead as quickly as possible? Read the full story in Dirt Rag Magazine.